This one's a little late in coming - apologies to those waiting! This month, Jonny and Scuba are joined by local promoter Donna Boyd (Homegrownalwaysbest), who picks out some of her favourite tracks. We also promote Lumo's event (which has now already passed...), but we do also chat battle rap developments, Jonny's interview with Solareye and Gasp's new album among other things. In the latest podcast, Jonny and Scuba are joined by SSU reviewer Hannah Westwater as we play and review the month's new tunes. This month: we get a bit serious and debate where the line is when it comes to emcees sharing political views, we look at recent battle rap controversies and reflect on the latest Beatbox Scotland event. Artists featured include: Solareye, Cheeens, Nity Gritz, Cojay Mac, SWVN, Werd, Skola and The Despicables. In the second podcast of the new series, Jonny and Scuba look back on 2017. What were the best Scottish hip hop albums of the year? What were the best international albums of the year? And what would we like to see happen in 2018? 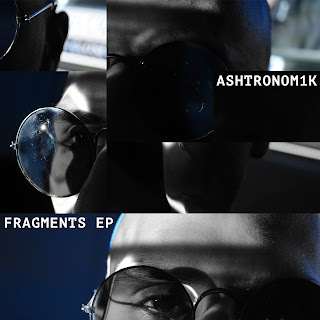 We also check out new tracks from Kid Robotik, Mackenzie, Tap End's Finest, Spawn Zero, Terryblingz and Princyboii, Sci-Fi Stu, Spee Six Nine, Profisee & STS, Werd and Mistah Bohze. As a wee addendum, Scuba also caught up with battle rap extraordinaire Ryza this week to discuss the Highland Battle League's first event. Enjoy. Our end of year podcast should be dropping very soon, but in the meantime, Jonny has selected a handful of his favourite releases over on BBC The Social. Looking ahead to this year, he's also put together this primer for Clash Magazine on the scene as a whole. The blog has been quiet for a while, but we're happy to say the only monthly podcast of Scottish hip hop music and commentary is officially back. Join Jonny and Scuba as we chat about the SAMAs, new battles, Loki's book and plug our recent ventures as per. We also check out new tracks by Steg G & the Freestyle Master, Eli Hermit, Jackal Trades, Stutter Jack, EVIL, Brian Jamieson, Jakeybytez, Spawn Zero and more. This month's pod is dedicated to Lumo and we share some memories of him. It's that time of the month: SSU editor Jonathan Rimmer returns with another video short for BBC The Social. This time around, he chats to Chaz B after the latest Resurgence event in Glasgow. He breaks down the moves involved and why you should consider giving it a go yourself. If you're new to the breaking scene and want to read more, he also recently chatted to Sideshow Maule of the Flyin' Jalapenos crew for the Sunday Herald. Multiple album reviews and live reviews with contributions from Hannah Westwater and Stephen Butchard. The publication was produced, designed and edited by Jonathan for academic purposes, but he is interested in working on and possibly distributing future editions. Anyone interested in working on such a project can get in touch at scotlandstandup@gmail.com. All articles published elsewhere have been credited as such and images have been credited with permission or used under the guidelines of creative commons. No income is being derived from this project. (The publication is also not associated with events promoter who went by the Urbanscot pseudonym. This wasn't intended! Shout out to Chris McDougall). Scotland's best noisemakers gathered a fortnight ago for the first major Scottish beatbox battle event of 2017 at Glasgow pub Nice N Sleazy. The free event attracted a loud and enthusiastic crowd, comprising a mix of hip hop heads and casual passers by. Hosts Bigg Taj and Spee Six Nine kept things moving with a brief live set while up-and-coming acts Ashtronomik, Red King and nine-man collective Togo Fam were on hand to play tracks from their new respective projects. 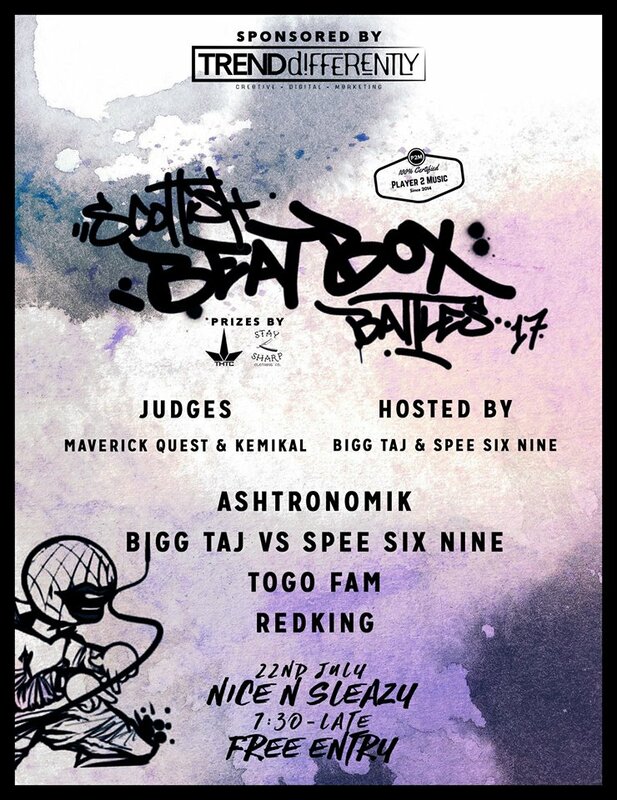 But the real showcase was the battles, which were hosted by UK beatbox champion ABH. The eight man tournament showcased beatboxers with a range of skills, from the more technically gifted to the more musically inclined. The full results were as follows: in the first round, Boycebox beat Napoleon, Styx beat Ionix, Maciek beat L, and 5th Element beat Biscuit Beats due to a no-show. Boycebeats took the semi final over Styx while Maciek knocked out Fifth Element. Maciek's versatile style, which combined hip hop and drum and bass styles, was enough to overcome Boycebeats in the final. He told SSU he was thrilled with the win: "It feels good. It was a tough competition, but I was very confident going into the final because I felt like the other semi final wasn't correctly decided. But everybody did their best and got what they deserved I think. "Improvising and trying out new sounds has been the most influential thing for me. I like to stand in front of the mirror, trying to make the silliest faces and sounds ever, and then develop them. "It was a big pressure to perform in front of someone like Bigg Taj. I've been watching his videos for a long time and I was inspired by a few of his sounds. He uses his voice to perfection." My name is Ash aka Ashtronomik. I do rap music. I'm a producer, I'm a writer. I've been recently putting some videos together as well. Other than that, I'm a project worker with YCSA, where I've had the opportunity to work with young people. It's been great for me to help some guys get into hip hop in different ways. You obviously moved from Iran many years ago. When did you first get into rapping? I came from Iran when I was 10 years old, but have lived in Glasgow since then. When I heard my first rap song I couldn't even speak English yet! It was like, 'Whoa, this is crazy.' But I actually got into rapping through breakdancing. I used to breakdance myself when I lived in Sighthill back in the days. I fell in love with it. I used to do it in my living room. But it became difficult because I went through surgery at one point. I was also really into my music, though, so I decided to focus on the music. Dancing was good for me but I couldn't progress as much as I could with the music. When I first met you were involved with Volition, a community project was set up by Loki several years ago. How did you first get into that? guys doing hip hop and we just needed a place where we could do our stuff and talk to others and relate to each other. I quickly became friends with everybody there and learned a whole lot of stuff. So when did you take more of a teaching role in this area? fact, he still is. Then, I just started doing workshops by myself and teaching with different community organisations in different youth centres and so on around the city. Can you tell me a little more about your role now? I run a workshop with YCSA called Represent. It’s short for Represent Media because the young people here manage their own YouTube channel. Working with the young guys here in Pollokshields - and we also have some over from Govanhill - we give a voice to the most marginalised. You know, guys from Romania, Slovakia, Czech Republic and all sorts of ethnicities. That’s kind of what I’m doing here in YCSA at the moment. What sort of stuff do you do in the workshops? It kind of started as just rap, where I was just kind of getting them to learn the beats and how to rhyme better. But eventually the guys enjoyed it and they told their friends to come over and we built a little team. It’s turned into more of a production, making beats as well as rapping, as well as getting videos done. It’s a whole set of activities to try and give them a genuine artist’s experience. Why do you think workshops like these are so important for these young people? I think it’s very important. First of all, speaking about myself, it’s changed my life because I’ve learned so much, met so many great people. I was one of these young guys. From what I’ve witnessed - I’ve worked with a bunch of guys - their confidence levels have just totally changed massively. Their language has improved a lot and it’s raised their aspirations. You have guys and girls that maybe socially isolated and by putting their energy into something artistic they’re able to have a new level of understanding about themselves. They want to different things and it’ll affect their careers in a good way too. It’s a start for them, a way for them to be empowered and do something. Why do you think hip hop in particular is such a positive force? I think hip hop from how I’ve experienced it, it instantly breaks down all barriers between different races and classes and whatever, and it just brings everybody together. You just feel the music and the culture and the elements to it. It’s life changing for a lot of people. And it’s fun obviously! You’d be forgiven for thinking this can’t possibly be Ciaran Mac’s solo full length debut – a few blinks around Scottish hip hop and he’s everywhere. Whether it’s his work with Rory O’B, hyped live shows or word on the street that he’s the Glasgow hip hop's freshest voice, Ciaran has earned his place at the heart of the community. Having made his name on the circuit, 'Rainy Daze' serves as a reminder why all eyes should be on him. Ciaran’s flows are the focal point of this release and he isn't stopping for breath. On opener Gimme a Second, he unapologetically takes shots at the “parasitic fantasists” of Scottish hip hop over an old school beat. Impressively, he strikes a balance between boom bap bravado and a quiet confidence that he can back it up. 'Rainy Daze' is a playground for Ciaran’s often relentless flow, demonstrating a real affinity for rhythm which, no, isn’t a rap inevitability. At times it risks being to the detriment of his lyrical skill – he really runs rings around many of his peers with metaphors and smart rhymes, but some of his best moments as a wordsmith struggle for air beneath flows so uncompromising. With a little development, though, it’s clear that he’ll easily establish a middle ground which allows equal spotlight for all of his skills as an emcee. And there are definitely shades of that on the album, with Let Em Be a well-judged moment of calm that adds valuable dimension to the release. Most of the beats are sophisticated but fairly straightforward (a scan down the tracklist reveals a handful of the scene’s production gems) and the record is all the better for it. Ciaran’s no-nonsense strain of rap is well suited to tracks that compliment but don’t distract. But make no mistake: there’s no lack of ambition here, and this effort sonically demonstrates Ciaran won’t be restrained by a scene that can be difficult to step out of. Munity, featuring words and production from Big Shamu, is a particular highlight. A sitar-like motif swirls throughout as both emcees go back and forth, making for one of the album's most addictive moments. But track two, Bag of Rations, is Ciaran’s mission statement. He's not kidding when he drops rhymes like “I like to spit so when I’m coming up with something sick I’m making sure that every word is hitting like a tonne of bricks”. He shouts out the hip hop community, a heartfelt moment of gratitude which may have seemed out of place coming out the mouths of other rappers – but there’s an authenticity to the entirety of the album that helps it fit right in. To many it was inevitable Ciaran Mac’s first full length would be one of, if not the, best of the year thus far, but that doesn’t detract from his achievement. 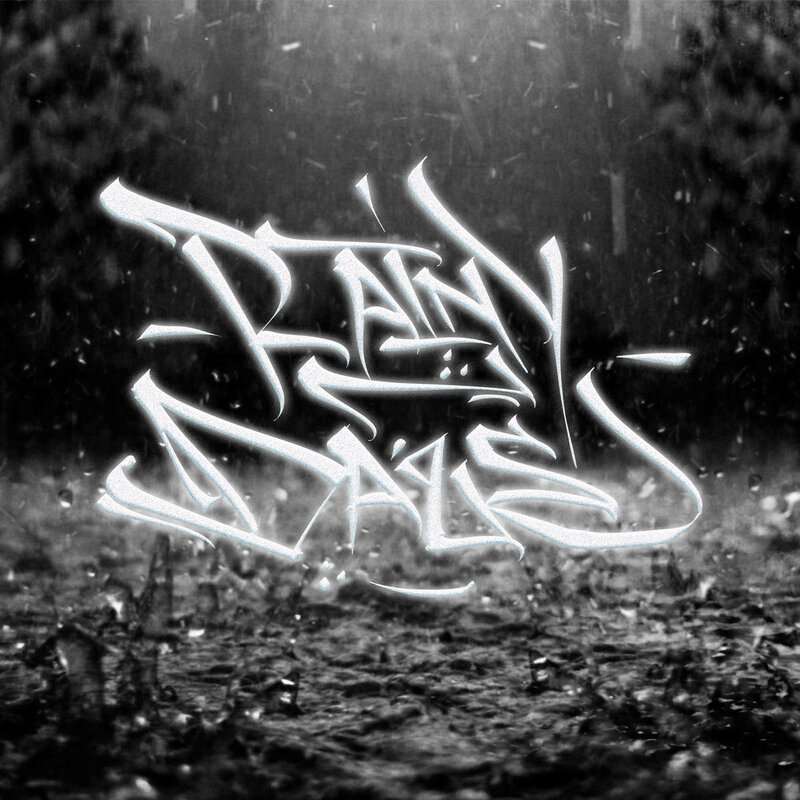 On 'Rainy Daze', he erodes any doubts left kicking around and does a good job of making sure you believe every word he says.